Non-profit fundraising software has changed how charities operate, and for the better. The ability to donate online, instantly, is a convenience that many donors use almost every month. In fact, even as a small fundraising software provider, enabling your clients to be able to accept payments on your e-commerce platform is now easier than ever thanks to PayFac providers. The ability to leverage the interface you already have and integrate a payments feature using simple API’s makes adding payments easy. This is particularly great news for small online fundraising organizations. They must keep the complexity down, and giving up, as much as possible to help the many in need. This is what becoming a PayFac makes possible for your software clients: quick setup, low to no setup cost, and low transaction charges. But first..
Can becoming a PayFac help my fundraising platform? In the past, if your clients had a business and wanted to offer goods or services that required people to pay with credit cards, you would have to make sure that each client had a traditional merchant account. Banks are naturally cautious and thorough; this means the process of getting a merchant account often requires large amounts of paperwork and set up delays. A PayFac, or payment facilitator, connects the charities you serve, their donors, and the banks. Put simply; it allows you to add an integrated payment platform to your software, without your non-profit fundraising clients having to worry about finding a third party gateway. 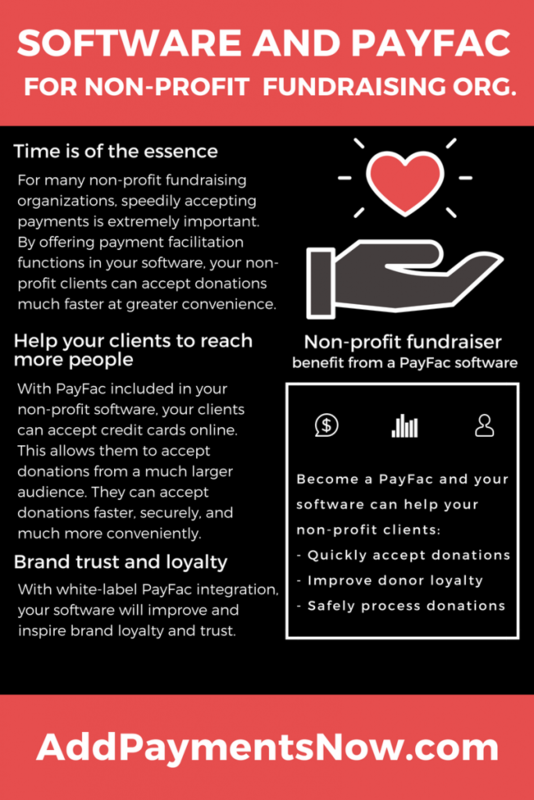 Whether your software as a service (SaaS) platform aims to help others raise money for a charity drive, organize an event to aid a specific cause, or even to help someone in need, you can easily install PayFac capabilities onto your non-profit fundraising software platform. As an SaaS with non-profit clients, you know all too well the challenges that these organizations face on a daily basis. Overhead costs, volunteers, and market saturation are just some of the things that they need to take into account. With the rise in popularity of raising funds online, it’s essential for each charity to stand out. In the past, non-profit organizations relied on big donations from single campaigns to help stay afloat. These donations often occurred at large-scale events with cash-in-hand contributions. Now, in the digital age charities and other organizations turn to software. Allowing them to synchronize and integrate with social campaigns, email marketing, paid media, celebrity endorsements and the like to raise funds. However, there is so much more competition online. Having access to a seamless payment method is one key to standing out from the crowd. Quick to start – PayFac capabilities are quick to install and offer seamless integration to your platform. This allows your nonprofit platform clients to begin taking donations immediately. This is ideal for emergency situations like natural disaster relief and aid. Unrestricted donations – New or existing charities can start accepting donations of any reasonable amount immediately, which opens the doors to a wider market of donors. This gives your non-profit software user a fighting chance to raise more money. Allowing new clients to accept credit cards the same day they sign up for your software gives you a huge advantage. Low transaction cost – Cost effective solutions are a primary component of running and maintaining a non-profit. Therefore, by integrating PayFac features that have a low transaction cost, your SaaS can deliver higher impact for your clients. Client Retention – User Experience, commonly referred to as UX, is vital. If your platform works seamlessly and quickly, you have a better chance of those users coming back. This will apply equally to you, and your fundraising clients. Repeat business is one of the most critical aspects of any SaaS company. Low liability – As a charity-oriented business, unexpected costs can severely impact your bottom line. When integrating non-profit fundraising software with a built-in PayFac function, you are not on the hook for chargebacks and refunds. The Payfac provider takes that liability so that you can rest easy. PayFac services are on the rise for a variety of SaaS and Independent Software Vendors (ISVs). In fact, forecasters predict that by 2021, ISV and SaaS businesses will generate up to $4.4 billion in profits through PayFacs. White-label options – With some PayFacs, you can solidify your brand as a comprehensive provider or opt for what’s called arm’s length branding. For many businesses, a white-label option is beneficial to ensure brand consistency and building trust with potential clients. Additional revenue– Software vendors earn a percentage of each transaction made. This means that while you’re providing a service and earning a profit from the sale of your software, you’re also earning a percentage of each transaction for your company. Clean, tested API’s – At AddPaymentsNow.com we only consider vetted PayFac providers. This way we can ensure that the PayFac features integrate with your platform, regardless of the framework your software uses. At AddPaymentsNow, we know the ins and outs of payment facilitation for donation software. Contact us today and let us pair your non-profit fundraising software with an optimal PayFac service.